Enriched Geranium: ¡Cuidado! ¡Hay pavos! 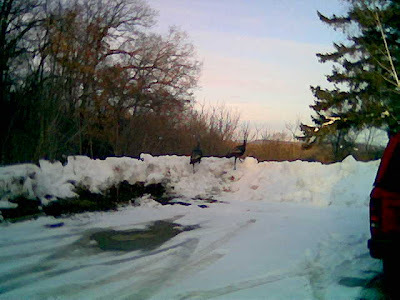 A few weeks ago Ms. geranium and I were walking in Owen Conservation Park and came across some turkeys drinking beer and smoking cigarettes. The thugs looked pretty annoyed that we were disturbing them, but they slunk away when I approached to take some photos. 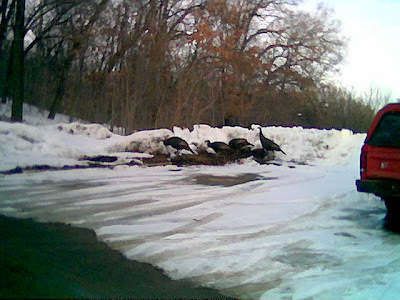 Now I'm reading news reports about wild turkeys in the same area that have been attacking mail carriers. I suppose we're lucky we escaped unscathed. We could have thrown a dead guinea pig at them. Well, I find that it's better to bring them into the fold. Otherwise their smoking and drinking goes toward things much worse. My mail carrier told me the the USPS is now offering free Avian Kung Fu lessons to anyone delivering mail in that area. Things the 40 YO says. Where Have All The Musicians Gone?